So first I want to start by saying that 50ml of this ink retails for $35 and can be had online for $28. In my experience Pilot Iroshizuku inks are well behaved and have a satisfactory flow. I am not certain however, that the consistent quality and beautiful bottle justify the price. I have found that other inks half the price are as good or better in some cases. My point: don’t think that for $35 you are going to get some kind of magical ink that is beyond the rest. 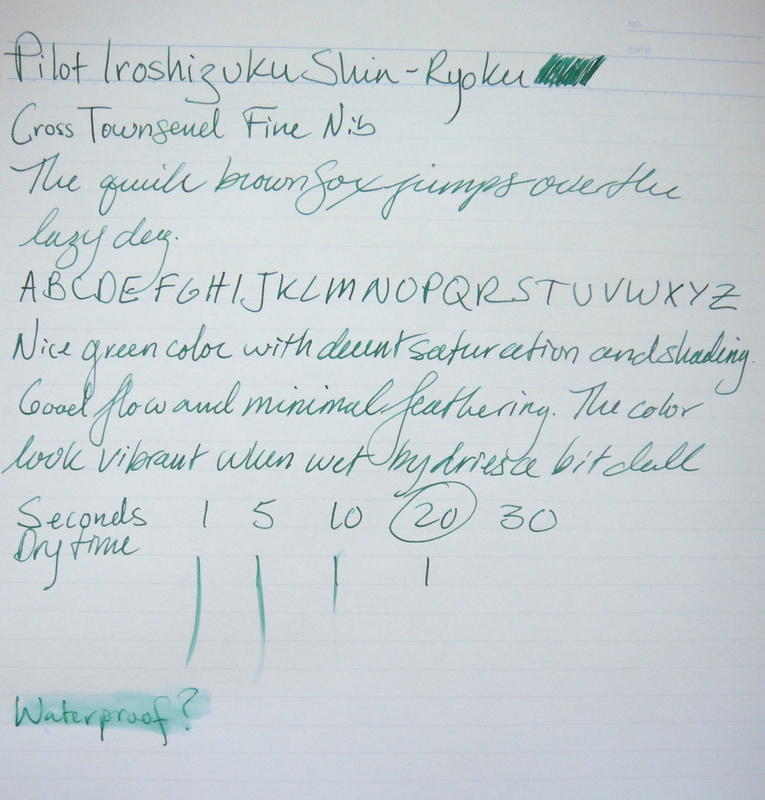 If you fall in love with one of the Iroshizuku colors, go for it you wont be disappointed. This ink in my opinion is very close to J. Herbin Lierre de Sauvage (I would do a comparison but my bottle had mold in it so I threw it out *harumph*). The translation of the name is “forest green” and the color is quite nice, particularly vibrant when wet. When it dries it ends up looking a bit flat which is disappointing. Shin-ryoku offers some nice shading (harder to see with the fine nib on my Cross) and like all Iroshizuku inks I have tried, no issues with feathering. Dry time is faster than most inks on Maruman Smooth-To-Write paper. The ink is not waterproof. I wont be purchasing a bottle of this one as Lierre de Sauvage is more vibrant when dried (I will be crossing my fingers that my next bottle wont have a mold problem).